If anything then June 2017 was about debates, this about that. Like last month there is always the constant opinion makers sprouting their advisory thoughts on various matters. 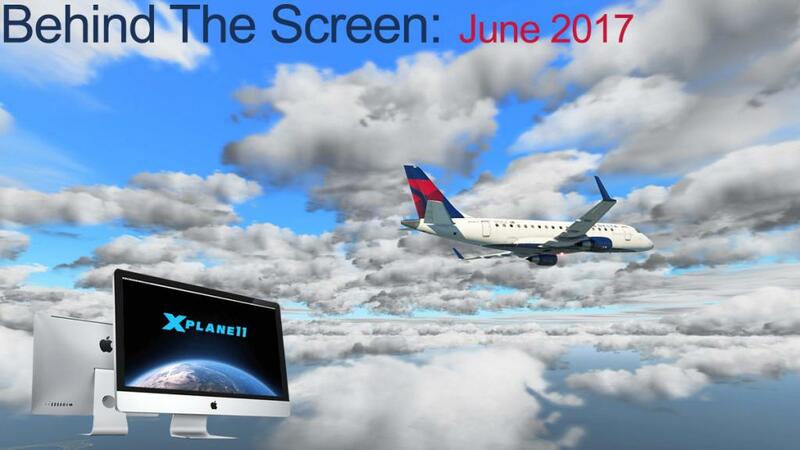 Mostly their poor frame rate (which I addressed last in last month's Behind The Screen) and of course in that X-Plane11 is far much worse in running on your computer than X-Plane10. Both are myths, and as big as like a certain Scottish Monster that lives in a big lake and eats children at night. I was there when the changeover from X-Plane9 to X-Plane10 became official. In that case most of the very basic scenery tiles were replaced to take in the changes to OSM (Open Street Map) and the opportunity to make the basic mesh textures into a much more higher resolution. Add in the new weather system, HDR lighting and other processing sapping features then X-Plane10 was a totally different setup from the very light X-Plane9. The step was huge, even by today's standards and it really killed off the notion of using a 512mb graphics card to do your visual processing. I know because I burnt mine out. 1gb Graphic cards were then basic requirement if you wanted to do X-Plane Simulation and although over its full run with X-Plane10 and the many refinements it was never ever going to a lite simulation were as your computer was concerned as a 1gb Graphics card did get you over the line then a 2gb card was the basic requirement... today a 4gb card should be your normal, but an 8gb card would be very nice. Like X-Plane10 over X-Plane9, then X-Plane11 is a very different animal in the way it uses your processing, but better threading with the coming Vulcan/Metal API tools will be a huge bonus to the great. But back to the current. Laminar Research do note you may get away with a 1gb graphic card and even 2gb, but I doubt that anywhere now. So if any of the unwashed out there are telling you that X-Plane11 is a far poorer relation to X-Plane10 then they are talking hogwash, or more to the point they are uninformed and have no credibility. Like with the framerate debate it is in their set up that is actually wrong and in mostly being too greedy in what they are trying to process. Even myself I run X-Plane11 with room to spare in the features and effects department and unless you can save up Apple's new Pro Mac at a killer US$5000 you won't be able to run X-Plane at anything near the full settings you would love to do. Laminar Research has gone a long way to make X-Plane11 far more efficient than its predecessor in not only restricting the twiddlers in messing up the graphic settings and with the last update (v10.02) in getting better efficiency gains from the simulator. If you are not getting the required replay from X-Plane11 and you meet the basic requirements, then you need to take a long hard look at your setup. The problem with the damage the unwashed do is to give the wrong advice to users that need good concise advice on how to run, buy and move up to the much far better environment of X-Plane11. Too many times I have read that a user thinking of moving to X-Plane11 only to be given poor advice and them turning away is bad for X-Plane and its forward momentum. Another debate that is important but was actually not main stream but involving the coming WorldTraffic3 plugin. Mostly the debate was around tdg sceneries but the implications are far more wide ranging. It is not the WorldTraffic plugin that is at the centre of the debate here but the underlying engine that will power the new WT3 version in the default built in ground routes. In earlier times X-Plane suffered because it had no traffic system built in. Most Aerosoft scenery came to you blank or empty and you were required to quickly hit the OverlayEditor for hours (and hours) to filling in the huge empty spaces with static aircraft and ground equipment to give you at least some sort of a realistic look when you arrived or departed from that airport. In 2017 that scenario is now completely the other way around. We are now required to delete our statics and areas that are now active. Over the last few years Laminar Research has built in to X-Plane specialised ground routes for its own built in ATC system. But the ground route system is a bigger and becoming a more important system for animated ground traffic systems. The built in A.I. system by all accounts is still quite basic and to be honest doesn't work that well either. X-Life by JARDesign is far better but the interesting system is WorldTraffic. To be honest the earlier built in ground route system by Laminar Research was quite basic and that resulted mostly in why the A.I./ATC systems didn't function as good as they should have. But over the last year a lot of work has been done on the networks and more importantly in the way you create them in the WED tool. They are now easy to set up, but also complex in what they can do to help in the visual and animated aspects of the scenery. World Traffic got around the poor default ground route system by putting in its own ground route system over the top... it worked but was heavily complex and hard to create and edit. Using auto code programmes to create the routes was not perfect either as they created far too many and are still to hard to edit. The newer coming WorldTraffic3 still uses its own ground route system for the extra features and for editing various areas for personal choice. But the creation of the routes will now default back to the built in default ground route system put in place by the WED tool. The new WT3 ground generation works and far better than you can imagine, but it also creates other important points in the fact that in how much in the future that ANY sceneries ground routes are going to need to be fundamentally correct and more importantly be inserted in the scenery. Any scenery with out these routes correctly inserted is going to be ignored, and no matter how good the scenery is created... which brought us to tdg's sceneries. There is no doubt that tdg has had a huge impact on X-Plane with his revolutionary brilliant small file sceneries. Without tdg's input and hard work, X-Plane scenery would be a far, far less usable place. But tdg won't steadfastly and even stubbornly will not insert the required ground routes into his WED sceneries? Users have offered help in the cause, but the issue remains that every current tdg scenery won't be active in the coming revolution of animated scenery. This situation is also connected to any payware scenery developer as well? No ground routes then no sale could start to filter through as the usability requirements become more of a standard requirement in every scenery, certainly I will severely downgrade any review scenery without built in ground routes in the future, if you are paying then they should be a standard installed feature. Thankfully most developers have got on board, but there are a lot out there that don't see the importance of the feature, they will soon. When you use WT3 with and without the built in ground routes, the differences are striking and even confronting. No ground routes will mean not using that scenery in the simulation, it becomes very quickly a black and white choice. There are options of course in first hitting the WED editor and creating the ground routes required, and for a few very important sceneries I use constantly that may be my only option. The second option is that other users create the required ground routes for WT3 (it already has a substantial collection), but simply inserting the required correctly laid out WED routes solves all the problems from the start. I can already hear the constant complaining of not having the correct routes inserted as I have already sampled the problems on airports not correctly configured in WED, not being able to use a favorite scenery without the traffic animations is a big disappointment and the choice is to always to find another scenery that is correctly configured, I am one, but soon there will far more in the same situation, hence the frustration and debate directed at tdg. The importance of the correctly configured WED ground routes in scenery can not be over overemphasized here. Not just that they are inserted, but there is a very broad constancy that they are all of the same quality and inserted into every scenery in a standardization of the format. In the past in X-Plane a lot of important items were available only in an ad-hoc situation, but to get a more cohesive flight simulator we have to start getting a few areas more standardised, we can start right here with ground routes. From when X-Plane allowed external plugins to be part of the simulation you knew that they would have a big effect on the way you fly in the simulator. Over the years there has been some really clever ideas and innovation in the way that plugins can enhance your flying experience. But for all their excellent contributions they also do come in shapes and sizes and the worst aspect is a badly written plugin that can cause you a lot of issues and constant CTD's (Crash to Desktop). Overall you have to very picky on what you allow into that golden plugin folder and what not to use. I have always sided on the side of caution than to try anything or everything, more so since you are a reviewer and the need to differentiate the differences of the actual item you are reviewing and if the plugin is affecting the process. So most plugins are tried and tested over long periods to a fail safe position. But this year in 2017 it has already been a simulator shapeshifting movement in the way that plugins are directly changing the way you visually access and fly in X-Plane. So what makes a great plugin. For me it is the one that is always there, that it isn't seen or heard but doing its job efficiently in the background. I will instantly dismiss and even some of the really great plugins if they start interfering with me in the foreground, I will tolerate a start up situation as the plugin does its loading sequence, but after that I don't want to see it or hear of it unless I need access to it, which again has to be easy, quick and efficient. And efficiency is another factor as by its standalone position it is efficient, but you are going to add on a few more in the same environment and then the plugins efficiency comes to be a major factor as it competes for space with the other side by side processing elements and that can start to take away some of your overall simulation processing power. In plain English that means your nice framerate buffer goes south. But why now? Most of the plugins coming into X-Plane now have mostly always been around anyway, so how is that new. We have had weather engines, effect engines and animated effects before so why the difference. The major difference is that they are more a commercial aspect than the even the brilliant creations of the past. They have to create and reach a certain standard to cover their purchase. This means the new breed are a much more professional product and have to meet the requirements of that significant position to justify their purchase. Not for a moment are these products totally perfect, anything in X-Plane to the simulator itself is an ongoing experiment and is constantly evolving as we live in the world of adjustable software and not wired in hardware. There are thousands of plugins that you will remind me that should be listed, but these three are significant. xEnviro; Yes there has been weather engines before and some very good ones, yes it is very expensive, yes xEnviro have the very worst PR and feedback to its customers that can be astounding and yes again that many users can't yet access this plugin either and mostly on the Mac. But you ask any current user if they would want to not use it anymore and my guess is they would defend it to their deathbed as would I. xEnviro's biggest factors is that it fills some big criteria areas, It is visually amazing (as I have bored you with now for months) but just look at the outstanding images in this site and in the reviews to prove my point. It runs totally in the background (unless your internet connection goes down) and it is very efficient in its operation and it doesn't totally destroy your framerate every time you have some nasty bad weather. Most significantly it changes the total look and feel of X-Plane but too the great, once run and savoured you can never ever see X-Plane and like an older simulator version go back again to the average. XPRealistic; A new plugin and again on an old theme and this time in effects. I loved my Headshake by SimCoders, but rk Apps simply blows it out of the water with their XPRealistic effects. Again once used you never want it out of operation in your day to day simulator interaction. Clever, very realistic, very versatile and simply great fun. My only apprehension is that it is based on the FlyWithLua plugin, which by all accounts is excellent. But the FWL plugin can have the odd side effects that brought has me to grief already by damaging other lua scripts in the simulator, only losing a day and half and replacing not only the master FWL plugin but replacing a few aircraft could I get back to reviewing, it was lost time I couldn't and still am trying to catch up even with this Behind the Screen entry being late as are a few of our latest reviws. I never wanted the FWL in my plugin folder, but I am still willing to use it because the XPrealistic plugin is so good. WorldTraffic; Classic Jet Simulations "WorldTraffic" plugin has been around for a few years. For a few diehard souls it has become almost an addiction to the cause. There are X-Planers and there are the WT obsessives. I am sadly one of them, but that is a requirement to get the shear realism out of the plugin's brilliance. The problem with WT is that it is very, very hard to access on a normal basis because it demands very tight editing in ground routes and layout, but get it right and your airport scenery looks just simply outstanding. Now in final beta is WT3. The latest coming version has gone back to the basics to be like X-Plane11's new interface in giving you the access to the plugins power without the stress or the complicatedness of the original and for current users you will have to throw out a lot of the way you currently have WT setup and the way you actually use it. But the results are certainly worth the effort. For current users the upgrade to WT3 will be free, but for the users that have been a little standoffish of the use of WT then I would say start saving. Currently all the three plugins noted above are not in their final form. XEnviro requires (badly) an update to X-Plane11 and the v1.07 is due whenever. XPRealistic in its current v1.0.9 version is excellent, but it is not in its total completed form and WorldTraffic3 has still in a little beta work and fine tuning mode still to be done. But by all accounts that later in the year then all the three of these outstanding plugins then will systematically change X-Plane in the way you access it and use it as much as the way that X-Plane11 has done this year also... and that can't be a bad thing. As the French say I will wish you "adieu" till next month.